A great way to green up your countertops while making them more aesthetically appealing and distinctive is to use recycled or salvaged materials as decorative accents. 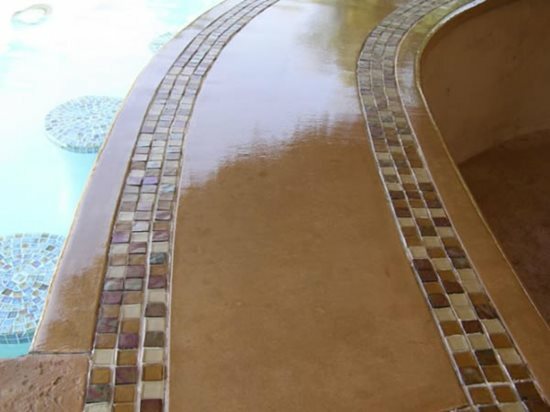 For example, you can use pieces of recycled glass or stone to add color and sparkle and recycled metal to create eye-catching inlays (see Concrete Countertop Inserts and Inlays). Jeff Girard of the Concrete Countertop Institute is a big proponent of using crushed glass from used bottles and jars or waste glass produced during the manufacturing of bottles, windows and mirrors. 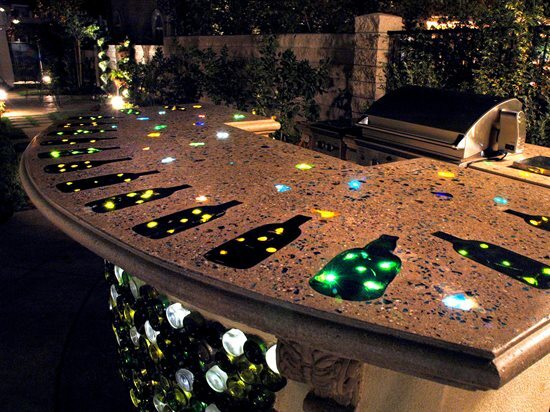 Scott Cohen of The Green Scene recently took a unique approach to glass recycling by incorporating 250 wine bottles (empty ones, of course) into an outdoor countertop for clients who are big wine connoisseurs. Instead of crushing the bottles, he melted them in a kiln so they would lie flat in the concrete, and then he backlit them with fiber-optic lighting (see Fiber-Optic Wine Bottles Light Up Concrete Countertop). Fu-Tung Cheng of Cheng Design often inlays recycled or salvaged objects in his countertops, either as a form of expression, to add whimsy or to achieve an earthy, natural feel. In addition to using tumbled and rounded recycled glass, he has embellished countertops with pieces of automobile engines, Chinese coins, fossils, and bits of turquoise and other stone.